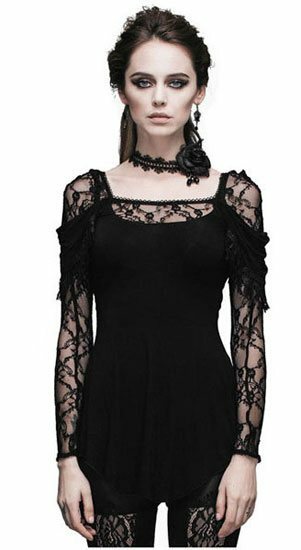 The Ava women's Gothic shirt is a long sleeve shirt with lace on the sleeves covered by shoulder shawls. The front of the shirt has a beautiful neck line trimmed with lace. The back of the Ava Gothic shirt is low cut with lace details. Made from cotton this shirt is soft and looks great. this shirt is lacy. goes well with a pair of leather pants. Interesting. Fun blouse purchased for concert will be perfect. Fits well, not loose. Looking forward to wearing it in New Orleans. Arrived very quickly, very happy with the quality and the material is so soft to the touch. The cut is very flattering. The sleeves are a little tight over the forearms, so take care when adjusting the seam so as not to rip the lace.